Keyword research. Successful bloggers need to do keyword research on a regular basis. Recently I find myself addicted and am on it every single day. And I find that its only for good. I used to use Market Samurai almost every other day to analyze on keywords, do market research, track my rankings and do competitor analysis. Long tail keywords are a promising thing, since there are so much of them out there that need to be tapped yet. While the others are overly competitive and there are not many (relatively). Long tail keywords, unlike the others (the short ones) are usually the ones that your target customers will be typing into the search boxes exactly. For instance â€“ â€œsony cybershot dsc-s5000 reviewâ€ or â€œbest sony cybershot camerasâ€ instead of â€œsony reviewâ€ or â€œsony cybershotâ€ (letâ€™s say Iâ€™m interested in buying a sony camera 😉 ). Now I am a regular user of Long Tail Pro (at the time of writing this review, I am a beta user of Long Tail Proâ€™s Platinum Edition) and use it multiple times a day (for good, and not out of addiction lol). 1. Long Tail Pro is able to analyze multiple seed keywords simultaneously and this is a HUGE time saver. 2. Long Tail Pro is amazingly fast and amazes me every time I use it. 3. Long Tail Pro comes with a one time payment/purchase and doesnâ€™t have any hidden fees or subscriptions to pay every month. 4. Long Tail Pro has Keyword Research, Competitor Analysis and Rank Tracker Modules. 5. Long Tail Pro pre-filters the keywords and saves me TONS of time. Let me walk you through a hands on session with Long Tail Pro in this video. This will help you take an inside peek at the functionality of the software. If you prefer to read text review, read on. One of the modules in Long Tail Pro is the keyword research module. You need to be logged in to your Google Adwords account in order to be able to pull up to 800 keywords per seed keyword you enter. Click on â€œaddâ€ to add a new campaign, and input the seed keywords. You can add multiple (wide variety of keywords from different unrelated niches!) but it is really safe to add a maximum of 5 keywords per campaign to stay Google-safe. After filling these out, if you click on â€œGenerate Keywordsâ€ (the BIG yellow button at the bottom) you can see Long Tail Pro to pull keywords from Google â€“ 800 keywords per seed keyword. But before the final list is shown to you, Long Tail Pro will filter out the keywords based on the filters you applied.Â The data is pre-filtered for you to look at and analyze â€“ this is amazing. Once you get the list, you can sort the keywords based on Avg. CPC, Local Search Volume, Global Search Volume and Advertiser Competition. Note:Â Advertiser competitionÂ is a value which is scaled between 1 and 100 (100 doesnâ€™t mean that there are only a 100 advertisers â€“ its a scaled value). It shows how popular a keyword is among the advertisers and also the number of advertisers who are interested in investing money on that keyword.The higher the advertiser competition, the most popular the keyword is â€“ your best pick. Letâ€™s say you find a keyword to be decent and want to investigate it later, or lets say you have found the â€œbestâ€ keyword. Instead of saving it elsewhere, you can simply press the star before the keyword (shown below), and the keyword will disappear from the general keyword list and go to â€œFavorites list. From the â€œfavoritesâ€ tab, you can quickly analyze all your favorite keywords in one place. This tab will contain you favorite keywords from all your campaigns â€“ very handy. Please note that this is a â€œPlatinumâ€ feature. So you will find this feature only in the Platinum version of the software. If you click on any keyword from the Keyword Research tab, you will be taken to the Competitor Analysis of that particular keyword. There you can find the top 10 results from Google for that particular keyword, as shown below. Once you are in the Competitor Analysis tab, you have all the information you need about the keyword. You can then use the information to find out how competitive this keyword is. The lesser the competition, the better. 1. Are there any exact match domains (EMDs) in the top 10 results with this keyword? If yes, this may be a good sign as well. 2. How many of those top 10 pages use the exact keyword in their page titles? 3. How are the page ranks of those top 10 results? 4. How many backlinks do those pages have? 5. What is the average Keyword Competitiveness of this keyword (the lesser the better)? 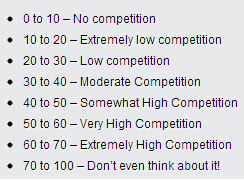 Keyword Competitiveness is a VERY effective number to perform analysis on your keyword. A very handy tool where you can go beyond keyword research. Once you have done your research and have either (i) built a niche site on a keyword or (ii) have written blog posts based on those keywords, you can track your rankings for those keywords using this module. You can enter as many urls as you want and check their rankings! I have intensively usedÂ Long Tail ProÂ at the time of writing this review. The screenshots and the video demo are done using the Platinum version of the software. The pro version ofÂ Long Tail ProÂ will have all the features except those that have the platinum lizard icon in there (the Favorites and Avg. Keyword Competitiveness are the platinum-only features). My conclusionÂ â€“ I strongly recommend this software toÂ every blogger for performing keyword research. It saves TONS of time since it can analyze multiple seed keywords in a single campaign. Handy features, lots of data and excellent speed makes keyword research much more useful and enjoyable withÂ Long Tail Pro. I give this software a five star! Click the image below to try Long Tail Pro free for 7 days!